In October 2014, we spoke with Mark Schwartz and asked him a series of questions about a) Stamp/Postal History Collecting, b) About the Philatelic Foundation and c) some Personal questions about himself. Here is what he had to say. How long have you been collecting for and when did you start? What do you collect? I’ve been collecting on and off since I was 8 years old, however long ago that was… When I first started, like most others, I collected stamps – filling spaces in a basic Scott worldwide album. Now, I collect a broad variety of material. Primarily postal history – Boston and towns in Essex County, Massachusetts (along the Atlantic); the first federal town circles of 1799; the New York Postmaster Provisional; and Prexies by air mail to Africa during WWII are only some of them. If you had to chose one item, what is your favorite item in your collection? My favorite item has to be a cover sent from Boston in 1651 from Nathaniel Maverick to his son in the Barbados. I believe it is the earliest letter known from Boston and the earliest in private hands from the original thirteen colonies. The first post office in the U.S. existed at that time, operated by Richard Fairbanks at his Inn. There were no postal markings then, and while it is impossible to know whether or not this letter went though the Fairbanks post, but I would like to think it did. If there was one item that you wish you could own, what would it be? ard could operate a scheduled packet service between the U.S. and the U.K. The 8d (or 16 cents) paid the private sailing ship rate out of the U.K. There is also a fancy red “SHIP/6” marking of Boston, indicating that there was 6c due for a private ship letter addressed to the port. A fantastic and supremely beautiful cover. What is your best memory related to collecting stamps? How were you introduced to collecting? I feel that I was introduced to collecting twice. The first time was when my parents brought me home my first album, and packets of stamps, from a trip to New York City. Sort of an apology for having left me and my sister alone at my grandmother’s for the weekend. I had a choice of a “Beat the Clock” game or a stamp album. Boy did I choose right! The second time was a few years after I had started working. I saw an article in the paper about stamp collecting, remembered that it was something I enjoyed, and found a local stamp shop in Jenkintown, PA called Edelman’s. While I focused on U.S. stamps, Milt Edelman introduced me to postal history with several transatlantic covers, and that stuck with me. What do you find most rewarding about collecting? Philately is rewarding on so many levels. It satisfies a need most philatelists have to collect something. 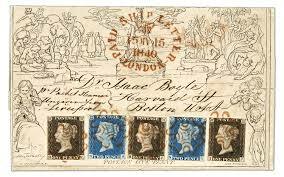 It gives me knowledge about history and geography that only stamp and cover collecting can do. It gets me involved with worthwhile organizations like the Philatelic Foundation and the U.S. Philatelic Classics Society. But maybe most importantly, it has provided me with a large group of friends who share the same passions and the same afflictions (philately). Do you attend stamp shows? If so, do you exhibit? I go to a large number of shows each year, some as a member of various societies, others as an exhibitor. I exhibit a lot. I have put together five single frame exhibits (with several others in progress) and five multi-frame exhibits (two of which still need a bit more work before they can be shown). I’ve exhibited nationally, and at FIP sponsored shows. I am very much looking forward to New York 2016. It will be a great event. Do you remember the first item that you sent to the Philatelic Foundation? I really don’t remember my first PF submission, but I can tell you about my last one. It was a NY provisional cover I had purchased quite a while ago as having an adhesive with the most common paper variety – the bluish white paper. As I was starting to put an exhibit together, I was looking at it more carefully and noticed that I had another cover from the same correspondence. 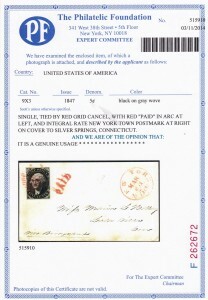 However, that cover had a PF cert, indicating that it was the very scarce gray paper, with only 12 covers known. The dates on the two covers were only a week or two apart. A careful search on the PF website found a third cover from that same correspondence, also the scarce gray paper, and now all three were postmarked with a month of each other. Thinking it very strange if the three stamps, sent by the same sender at around the same time, would be from different sheets (and thus different papers), I sent it into the PF, asking whether this might be a gray paper also. 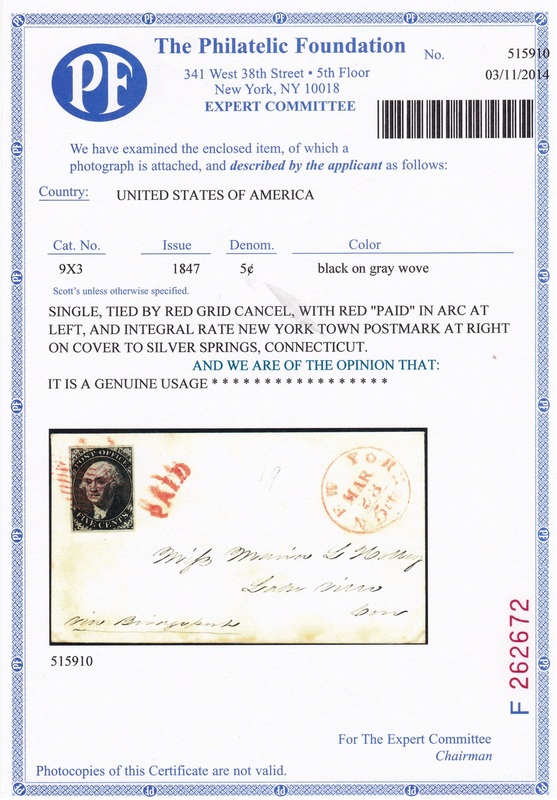 After a careful evaluation, it was returned with a certificate for the gray paper variety, and only the 13th such cover reported. This is a great example of the value of the PF Search database, and of the expertise that the staff at the PF has. What is your role as a board member? I consider that my role as a board member is to provide oversight to make sure that the Philatelic Foundation operates with certain financial and ethical standards, and maintains its position as the premier expertizing organization in philately. I bring strong commercial and analytical skills to the board, and an abiding interest in philately. Most recently, I led the project to create our new, modern web site, and continue to oversee its growth. Don Sundman and I make up the marketing committee and I also chair the cover committee, to ensure that we adhere to our published standards for evaluating covers. What is the best part of being a board member of the Philatelic Foundation? The best part of being a Board member is the people I have a chance to work with. The fact that the meetings are usually only a train ride away (I live in Philadelphia) isn’t bad, either. Where are you from? Where did you go to school? What do/did you do for a living? I grew up near Boston, along its North Shore, and got my undergraduate degree in Chemistry from M.I.T. I then went to Indiana University for my Masters in Organic Chemistry and – after I had started working – to Drexel University for an M.B.A. in Marketing. After Indiana University, I moved to Philadelphia to take a job as a Medicinal Chemist with Smith, Kline & French Laboratories. After about 9 years, an M.B.A., and some name changes (the company’s, not mine), I transferred to the Marketing Research Department. I eventually ended up in Product (or Brand) Management, responsible for the company’s biggest drug, Tagamet, for ulcer disease and other g.i. problems; then for the oral antibiotic business, Including Augmentin and Amoxil. I stayed with what is now GlaxoSmithKline for 37 years, ending my career back in R&D in a Strategic Planning and Business Development role. I traveled a lot on business, and my favorite place was London, the site of our headquarters, and one of the world’s great cities. In the U.S., probably my favorite city is Washington, D.C. I’m there fairly often, at the National Postal Museum, or one of the many other museums there, and because my nephew and his wife live there, with their three children. Do you have any other hobbies other than stamp collecting? Stamp collecting, with its many facts – exhibiting, presenting, writing, shows, and society and organization work – doesn’t leave me much time for seriously pursuing other hobbies. Food? If I had to pick a favorite, it would be somewhere between Italian and the various cuisines of Asia.